Last week I mentioned riding boots as a fall item that could potentially get a lot of wear, and my friend Mandie has asked that I show some ways to style them for real life. 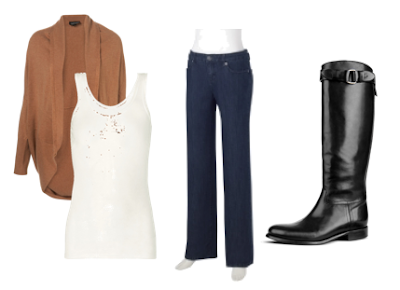 I put together some outfits on Polyvore in case you're wondering how to justify the purchase. And to prove my point, I've used the same boot for every outfit - it looks just like mine by Corso Como. I chose a pair that's not too bulky around the ankles and without lots of detailing so it doesn't try to be the star of every outfit. This is a no brainer. My sweater dresses aren't this clingy, but it's the perfect cozy outfit for when you didn't shave, are cold, or running late. The scarf keeps it interesting and makes it look like you thought about it. I also substitute leggings for the tights if it's cold or I accidentally poked a hole in them. I've noticed that Prince William's girlfriend Kate Middleton wears boots all the time, and does a great job of keeping them from looking too casual. I love wearing my boots with my knee length coat in the winter. 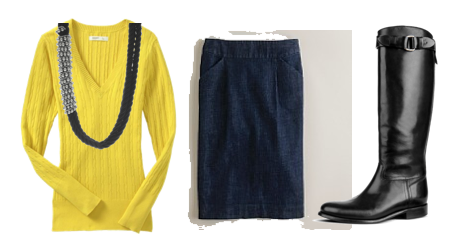 Under the coat, and at the office, I wear bright dresses or skirts with knit tops to offset the black on my legs. I think as long as you stay away from flimsy fabrics or lacy details, the boots go with more dresses than you'd think. I wear so many different combinations of this outfit - it's my running late, no time to think option. From September to about March, I grab v-neck tops and a skirt with my black boots and a chunky necklace. I've found that you look dressy by wearing a black or gray skirt and the same knit tops that you pair with your denim pencil skirt on more casual days. When it starts to get warmer, I wear more yellows and light blues with the skirts to keep from looking too wintery. This is obvious, but you'll wear your boots with your jeans a lot. Tucking them in is an option, but keep in mind that doing so is like wearing skinny jeans. If you can do that, tuck away! Cute! I love riding boots- but wouldn't know what else to wear them with besides jeans. Great ideas- love all of the potential outfits. Thanks Haley--just what I was looking for!